Getting the polytunnel ready to go is taking forever, but while we are getting on with that, little seedlings are happily growing on windowsills. 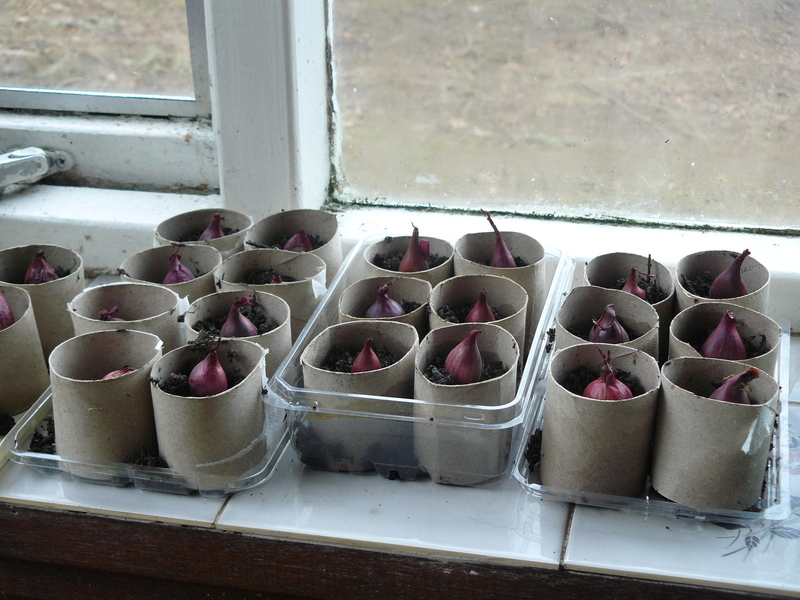 The seeds that are not already planted into toilet paper tubes are planted densely in (cardboard) trays. Placing the seeds so closely allows me to germinate a larger number in a limited space, when warm windowsill space is at a premium. Stock that will be used to populate the polytunnel is growing apace. Today at lunchtime I got outside for another hour or so of digging. We have been slowly digging the trench for the polytunnel polythene. There has been a lot of digging to do since we moved in here and there is a lot more still to do. Aside from the polytunnel groundworks, there are also six more vegetable beds to be dug. When I say I will be digging the vegetable beds, what I really mean is that I will be taking the turf and flipping it over to expose the top soil and allow the grass to decompose. I am broadly going to be operating a ‘no dig’ or minimal dig system. We are fortunate to have soil that is a high quality loam which should be ideally suited to this sort of a system. So once we are finished with the initial creation of the beds, requirement for digging will be minimal. The benefit of a ‘no dig’ system is that the soil is left in peace and the micro-organisms that inhabit it can get on with their jobs undisturbed. Worms can also be left alone to do their job and will aerate the soil for you. All you have to do is make sure to add in some good compost at the end of the year. 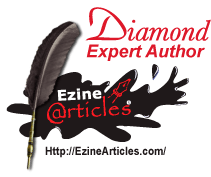 (We and our worms are working on creating our own.) I shall also be experimenting with adding nutrients through a sort of chop and drop system, so we shall see how that goes. 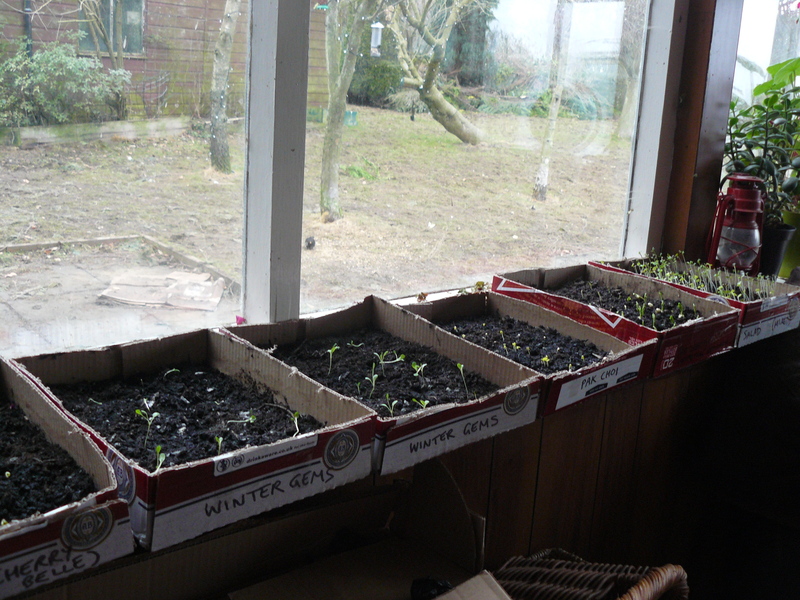 I currently have several cardboard boxes on windowsills in the porch in which I am growing seeds. There is no need to buy expensive plastic trays when you can grow seedlings of quick-maturing plants like mixed leaf salads and radishes in shallow trays cut from cardboard boxes. Cardboard boxes are perfect for the job – they can withstand a fair bit of water without breaking down but then will be easily composted when they have done the job. Don’t throw out toilet roll tubes as they are also perfect to grow seeds in and can even be planted in the ground to decompose there as the plant grows. (This is perfect for starting plants which don’t like to have their roots disturbed, like sweetcorn.) I place groups of toilet rolls inside any food packaging trays we have saved, fill them with soil, plant away and then water when necessary. Easy. While we are on the subject of recycling – plastic drinks bottles make perfect mini-cloches for early spring plantings. They could also save your young plants from mice and other rodents. When summer comes around, save the sticks of any ice lollies to use as plant labels. I also never throw away a glass jar – they will really come in handy later in the year when it comes (with any luck) to making jams and chutneys and other preserves. Fingers crossed! My mum reminded me of the children’s song with that line when my allotment broad beans were ripening last summer. Today I have had it as an ‘earworm’ all day. It keeps popping into my head every time I walk past the broad bean sprouts growing on the windowsill in their recycled toilet roll tubes. Speaking of worms, those in the wormery seem to be doing nicely. When they were first settling in they tried to make a few bids for freedom but they seem happier in their home now. They do like to be kept warm at night though. 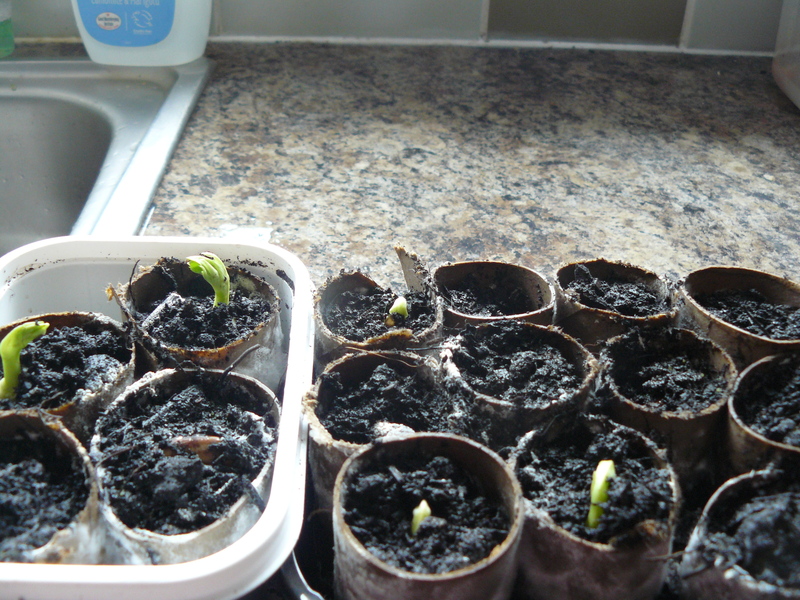 A few more broad beans just sprouting. Having yesterday experienced the downside of living in a house in the countryside with an old septic tank, today we found out first hand about one of the benefits of rural life – there is always someone nearby who you can call to help you out with little crises – like a broken septic tank pipe for example. The very friendly and helpful man who came over this morning was very familiar with our sewage installation – he has been sorting out problems with it for twenty years or more. He grew up at one farm within hailing distance and now lives at another, just within view of our front windows. He is clearly going to be the person to go to for lots of local info. He kindly cleared a blockage and made a repair, though we will have to go to some expense in future to replace things. The septic tank is old, but functioning fine. But it was very full! Fortunately, another helpful man was able to come out just a couple of hours after we called him to solve that problem. We have had to get back to work today, so polytunnel building is on hold for now. It will recommence next weekend when we are able to get outside during daylight hours. I may manage to get out and finish the ditch digging during my lunch breaks but that will be about all. Today has been a day of highs and lows – this morning came the high point of the day: a static caravan for members of our mini-collective has finally been positioned in the correct location. It is great to see it there, safe and sound, after what has been a rather bumpy journey getting it there. Unfortunately, this afternoon we had the rather bad news from the neighbouring farmer that the pipe to our septic tank is leaking. Oh dear. I just hope that the problem can be rectified quickly and is not too costly! It turns out that putting up a polytunnel is a really big job! Today we went into the outbuilding and commenced joinery. Literally hundreds of nails later, we have assembled the doors for both ends. They should stand the test of time. At times it felt like overkill for an outdoor building but we followed the manufacturers instructions. It was rather a frustrating job at times. There were quite a few nails that had been machined wrongly or were not fit for the job and some of the timber supplied was not very good quality. Still, the doors now they are finally together look fine. Some of the trench for trenching the polythene has been dug but there is still a lot left of that to do, plus the holes to dig for the door frame to be set into. The frame construction is yet to be completed and then we have to cover the thing. How do people manage to do this job with a couple of people over a weekend?? ?